Not a sprint, not a marathon. This past weekend, I ran the Pensacola Double Bridge run. It's 15 km, or roughly 9.3 miles and approximately four of those miles are on bridges. Using Runkeeper.com, I tracked my speed and location with my phone's GPS. 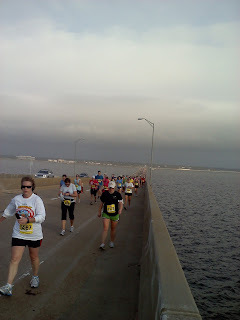 What I found interesting was that instead of giving me the height of the bridges as I slogged up them, runkeeper gave me the elevation of the water...so, an elevation of 0 ft. 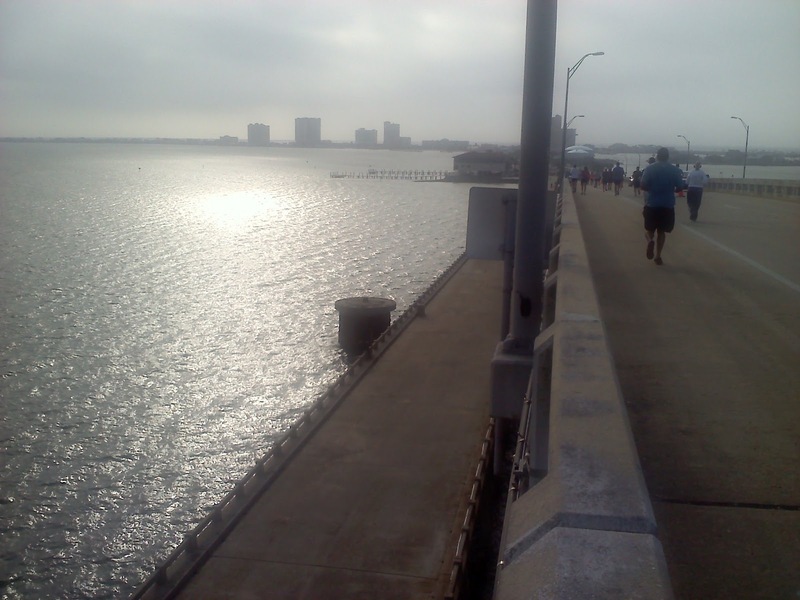 It was a little disappointing to accomplish something (albeit a rather minor accomplishment of crossing a bridge), and to have the internet deem it inconsequential. At the start of bridge #1, three miles to the other side. Still 1.5 miles to land. 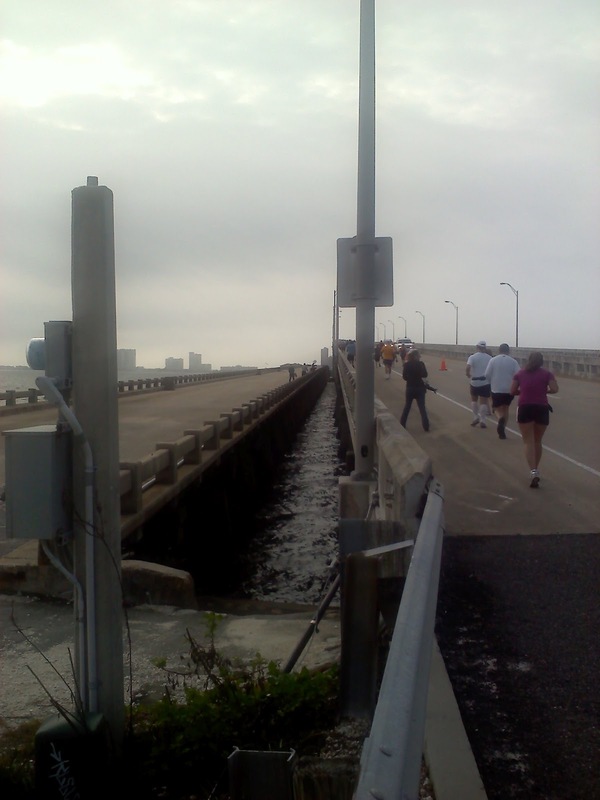 Bridge #2, notice the elevation change. 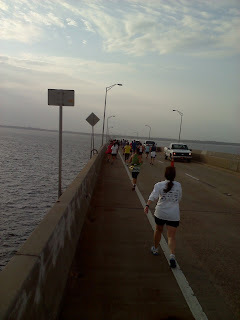 At the top of Bridge #2. 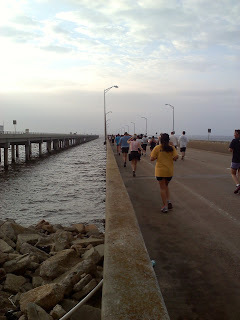 I'd used the Double Bridge run as a partial threat to myself to keep up my running over the winter. Even so, I kinda slacked off and paid the price. With that in mind, I'm focusing my athletic efforts on getting faster. My goal is to run a 10:00 on my 1.5 mile physical fitness test in April, so I've got some training to do. I think that as I've gotten older, I've accepted the fact that it's unlikely that I will ever be "the fastest" or whatever superlative is most fitting. However, there's nothing stopping me from becoming "the most," which is to say, I can be exceptional by being very well-rounded...a "utility player." I might not get the spotlight, but I will get stuff done. Yours is the Earth and everything that's in it..."